In this weekend workshop, create a stunning wall piece on either glass-on-glass or on wedi board. 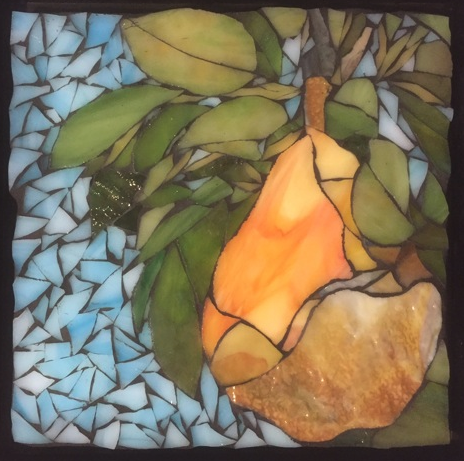 Explore the double-reverse mosaic method with artist-instructor Deb D’Souza. Starting from a simple design, learn to plan, select colors, shape the glass to build out your vision. Class meets on Saturday, May 18, 9am-5pm, and Sunday, May 19, 11am-4pm. Each student will be asked to bring a simple idea/design, consisting of (2) designs approximately 11 x 14 inches. These “cartoons” should be simple, like you would find in a child’s coloring book. Deb will also have several options available the day of class. All use of tools, assorted glass, wedi board, adhesives, and grout will be provided or included in the $35 materials fee. If you want to have a glass-on-glass project, buy a frame with an 11 x 14 inch piece of glass in it. Students will be given an hour for lunch. Buy something in town or bring a sack lunch, plus beverages. Warning: Mosaic Art may be an addictive activity; your life will not be the same! Debra is a member of SAMA (Society of American Mosaic Artists) and the Minnesota Mosaic Guild. She has displayed her mosaic art in multiple local and national exhibitions. Her work is featured at Riverwood Art and Frame Gallery in Eau Claire, WI, Woodland Studio in Stoughton, WI, Crossings in Zumbrota, MN, SEMVA in Rochester, MN and Lanesboro Arts Center in Lanesboro, MN. One can also see the scope of her art at her website debradsouza.com. Price is $195 with $35 supplies.